A young woman picks up a book left behind by a stranger. Inside it are his margin notes, which reveal a reader entranced by the story and by its mysterious author.Â She responds with notes of her own, leaving the book for the stranger, and so begins an unlikely conversation that plunges them both into the unknown. The writer: Straka, the incendiary and secretive subject of one of the worldâ€™s greatest mysteries, a revolutionary about whom the world knows nothing apart from the words he wrote and the rumors that swirl around him. The readers: Jennifer and Eric, a college senior and a disgraced grad student, both facing crucial decisions about who they are, who they might become, and how much theyâ€™re willing to trust another person with their passions, hurts, and fears. 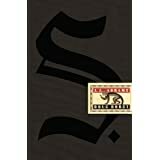 S., conceived by filmmaker J. J. Abrams and written by award-winning novelist Doug Dorst, is the chronicle of two readers finding each other in the margins of a book and enmeshing themselves in a deadly struggle between forces they donâ€™t understand, and it is also Abrams and Dorstâ€™s love letter to the written word.